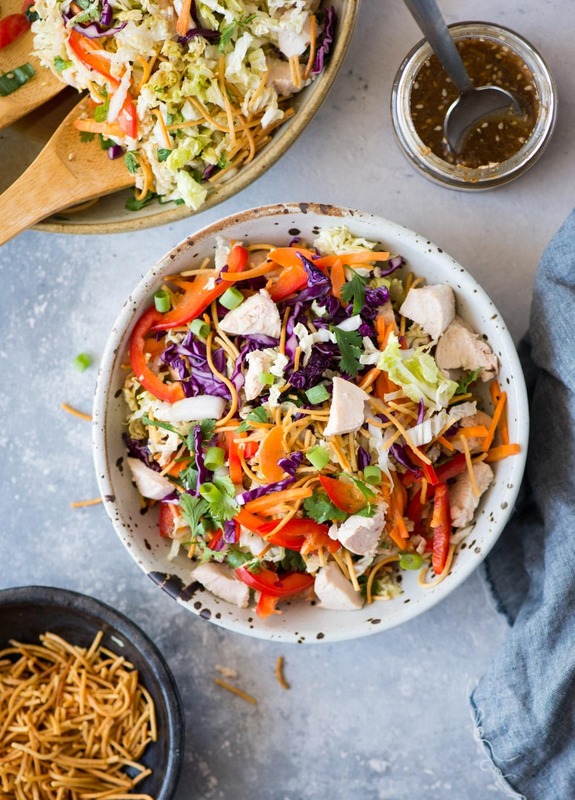 This Chinese Chicken Salad with Chicken, crunchy vegetables, crispy fried noodles and Asian Sesame dressing is a summer staple. 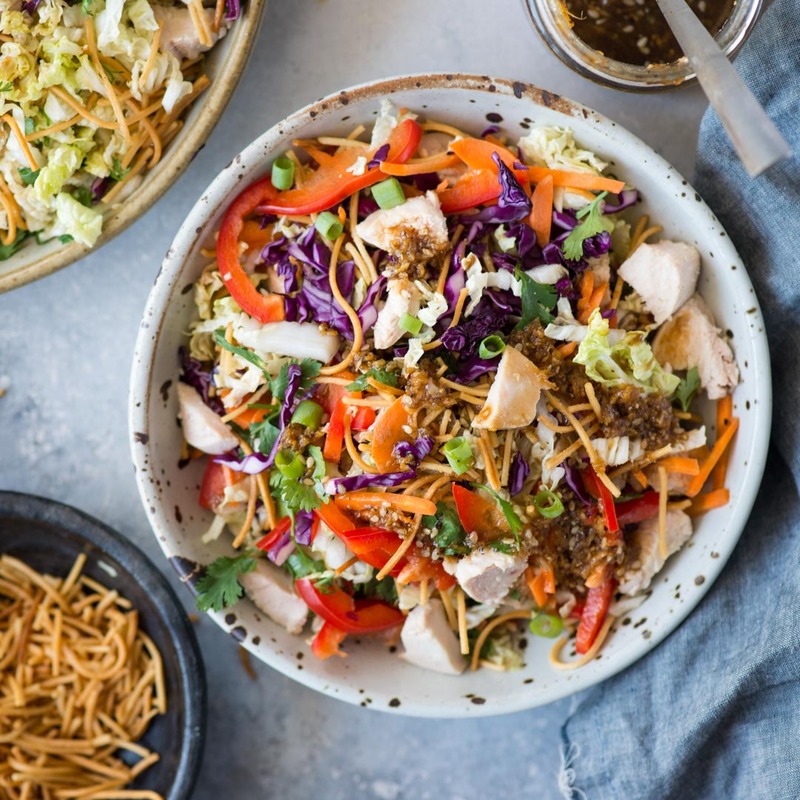 Healthy and light Chinese Chicken Salad with an Asian Sesame dressing is our new favourite salad. This salad is really refreshing and can be made for a bigger crowd easily. The Sesame dressing is sweet and savoury. Prepare the veggies in advance and refrigerate it up to 3-4 days. Just before serving bring everything together and serve. Summer is in full swing and it is unbelievably hot in my part of the world. Going to the kitchen and preparing a meal has become a nightmare. I am trying out new salad recipes every other day which involves no or very less cooking. Fresh Veggies: Major portion of the salad is veggies. So make sure the vegetables are fresh and have a crunch to it. Soggy or wilted vegetables would spoil the salad. Vibrant colourful veggies not only makes the salad taste better but also adds lots of nutrition. I like to add 3-4 varieties of vegetable to my salad so that you can taste each one of them in every bite. If you don’t get Chinese cabbage then Iceberg lettuce would be the closest substitute. Make sure you cut the veggies to bite-sized pieces. Chicken: Here we have multiple options. You can either get readymade rotisserie chicken or use any leftover cooked chicken. Sometimes I also poach the chicken breast in seasoned chicken stock and then use it. So, I leave it up to you to decide what you would like to use. Salad Dressing: The Asian Sesame Salad dressing is really good and brings together all the components together. The dressing is sweet, savoury with a nutty flavour from the sesame seeds. Here is a little trick that does wonder to the dressing. Slightly toasted sesame seeds and roughly crush them in a mortar and pestle. Crushing the seeds releases aromatic oil and ads so much flavour to the dressing. Make sure you use low sodium Soy sauce. I have observed, few brands are very high on salt. 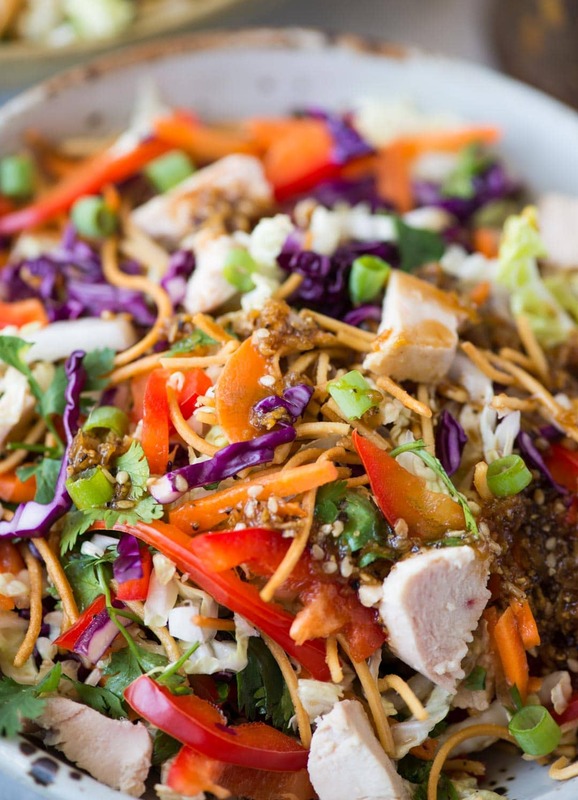 Fried Noodles: Well one of the best things about this Chinese Chicken Salad is fried noodles. It adds so much crunch to it. Fried noodles are easily available in Asian grocery stores. If you can’t get hold of it then here is a guide on How to fry noodles at home. I always keep extra on the sides while serving, because they are so addictive. 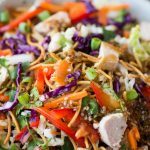 Like many other salads, you can store this Chinese Chicken Salad stores well in the refrigerator. But while storing you need to store the dressing and the veggies separately. If the veggies are tossed in the dressing, then it is not advisable to store it for longer. The veggies start to release water and become soggy because of the salt in the dressing. I prefer to store chicken separately, not along with the veggies. So here is a great chicken salad for your summer barbeques or picnic. In a glass jar add all the ingredients mentioned under salad dressing. Shake well until everything is mixed. 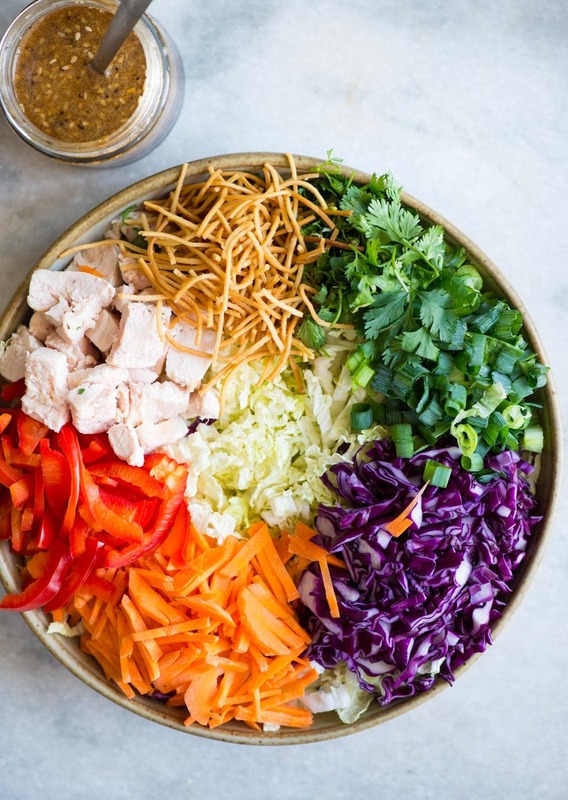 In a salad bowl, big enough to hold all the ingredients, add all the veggies except fried noodles. If serving immediately, add fried noodles, pour the dressing and mix everything well. Make sure you use low sodium soy sauce. Else the dressing might turn salty. Check the seasoning, and add more sugar to the dressing if preferred.